First line: While some rooms on the estate had monsters hiding beneath the beds, Tella swore her mother’s suite concealed enchantment. Summary: At the end of Caraval it appears that Scarlett and Tella are now safe from their evil father. But this is far from the truth. Tella is entangled in a bargain with a mysterious friend. This friend plans to help Tella find her mother, who disappeared years before, but it comes at a price. Tella must find out the Legend’s real name. 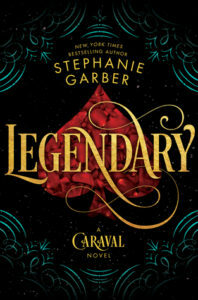 However, the truth could bring about the end of Caraval and Legend himself. Highlights: Once again I cannot help but rave about the beautiful cover! But the language and story make it even more wonderful. I was a little weary about reading Tella’s story when in the previous novel she was a minor character that caused much of Scarlett’s troubles. However, I was surprised by how much more I enjoyed this book than the first one. Tella is a tough girl who does not think that love is anything she is destined to experience. This is quite a change from many YA novels where the girl only wants to find love. She is smart and tricky. She is not scared to get her hands dirty. I loved the Fates! So creepy and detailed. I was truly terrified of the Undead Queen and her Handmaidens but not more than the Prince of Hearts. Everything about him makes my skin crawl. The addition of these supernatural beings expands and makes the story even more elaborate than Caraval. That ending! Throughout the story, we follow Tella as she tries to figure out what is real and what is not. I felt like I was slowly going mad along with her trying to piece together all the clues. As we reached the last few pages, I kept wondering if we were going to get another book and we certainly will! I wonder if it will follow Tella some more or expand on another minor character. Either way I am in! Lowlights: That I have to wait a year for the next book! FYI: Book 2 in the Caraval series.